I also put together all of the split nine patch blocks that I received from my local quilt guild swap. And here's the Starry Path block that I made for the We Can Do It Skill Builder Sampler. I don't expect to get much done this week sewing wise. My mother is in a nursing home and I have to make some hard decisions this week and get things settled. I knew this would be part of the process and that the time was coming. I just hope things go smoothly without any regrets. This week's Give-away from April at KoolBeenz is sponsored by Skye Reve Fabrics. Click here to check it out! PhillysBlarney is having a giveaway. You could win the Traveling Stash! This giveaway ends Sunday, December 4. See if you can win and give the STASH to visit your home. Here's another chance to win an Accuquilt GO! Baby and three dies!!! Here's block #17 of the We Can Do It Skill Builder Sampler. It's called Starry Night. Yeah! Step 2 of Orca Bay was fun and a big scrap buster! I don't have many orange strings left. Here are my seventy-two 3.5" squares. After I took the picture for WIP Wednesday's post regarding the split 9-patch blocks that I got at our guild meeting swap, I decided to play with block layout. I played for about an hour or so and ended up with a "w" pattern. I thought that I already had over an hour into the layout that I might as well number the blocks in rows and start sewing. Well, the blocks matched up really nicely. What I thought would be a WIP for a long time turned in to a quilt top! It's been a really busy week here with working both part-time jobs. Geez. But I did seem to accomplish a lot this week. I have all of the chevrons cut and half of them sewn (30/60) for the Chasing Chevron's QA (see button on sidebar) to get to the site. I am happy with my color choices except for that blue one in the middle. A friend told me that the pattern may get lost in the quilt with the background color. Those are made and we'll see how it plays out in the end before I decide to replace them. I played with my new blocks from our local quilt guild swap last night. Eighteen of us swapped split nine-patch blocks. This will probably mess with the layout a little more to get an up/down "W" going. But I do see this being a WIP for quite a while. I COMPLETED the Diamond Chains QA California King quilt. Whohoo! The FMQ on it is very very dense and it really feels good to be under it. It's almost like getting a hug. A lot of my time this week was consumed by Bonnie Hunter's Orca Bay Mystery quilt. I have the 224 little squares done in step 1. Whew. But I love my color choice and they were well worth the time. Quilty Habit is having a giveaway. Jess is ready to send the Traveling Stash on its way again. Check it out and good luck! Orca Bay Step 1 Complete! I'm excited to say I have the Orca Bay Step 1 almost complete. Whew... that was a lot of work. I'm sure it will be much worth it. I love the colors in my first 224 tiny blocks already. I have about 60 or so all trimmed. All of them are sewn, but need trimmed. 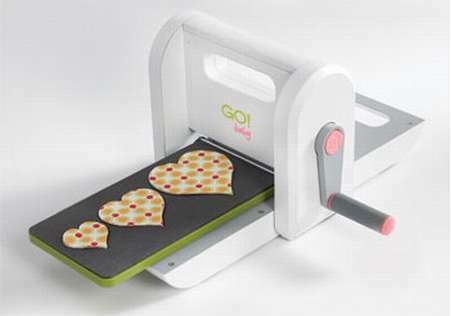 Check out Lily Pad Quilting for a chance to win an Accuquilt GO! Baby, three dies, AND fabric!!! Well, I worked from about 9pm until 2:30am. I have FIFTEEN blocks of Orca Bay step one DONE. Whohoo! When Bonnie says neutral, I say neutral. When Bonnie says black, I say yellow. We'll see how that works. I like the little blocks. They are all squared up and ready to go. I'm not a fan of cutting. BUT the best news is that if I counted correctly, all my little blocks for this step are DONE! I LOVE chain sewing. I also like chain pressing. Now that the hard part (the cutting) is done, I'm good to go. These are the results of my first FNSI. 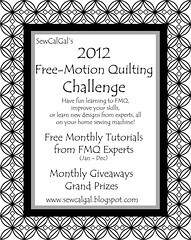 This week I registered for the 2012 FMQ challenge. It's like a block a month with tutorials. I really need to improve my FMQ skills and like I always say... It's only ONE block a month. LOL. Click on the button on my sidebar. Help a kid that needs a stocking and link up and you could win a cool prize. There are tons of sponsors. Link up and win!!! Hop over to the Chronicle Books Web Site to check out their Happy Haulidays contest. The Charity I would choose would be the Blendon Middle School library; 90% of the books I buy end up there anyway! Here are the books I would choose to donate. So let's see what fun stuff we'd add: When you comment, you have a chance to win if I do.